Fifty years ago today Pomeroy was bustling with excitement as the 4th annual Big Bend Regatta kicked off three days of summer fun. 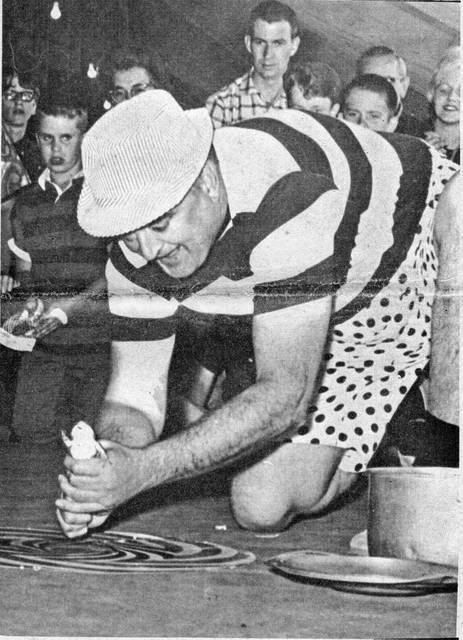 Photos and articles from The Daily Sentinel’s 1968 Big Bend Regatta preview edition in the days leading up to the Regatta detailed some of the favorite activities, including boat racing, a pie eating contest and of course, frog jumping. Additionally, there was a parade, rock and roll artists performing, tub races, and a home talent show. (Above, Right) The photo caption from the preview edition states “Kay Harrison, one of the racers scheduled to compete again in the Big Bend Regatta racing program at Pomeroy this year, is in a B-Hydro class boat.” (Above Left) The photo caption from the preview edition states “Attorney Fred Crow, who can be colorful in the courtroom as well as in his role of chairman of the Big Bend Regatta’s Frog Jumping Contest, promises a bigger and better Jump event this year…. (pictured) he launches his Senior Division jumping winner of last year.” The Frog Jumping Contest took place over two days at the 1968 Regatta.